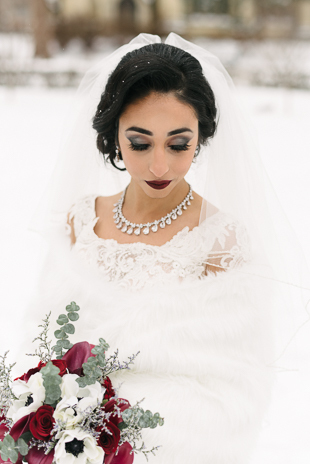 This Vintage Inspired La Maquette Wedding Is One Of A KindThis snowy wedding will make you reconsider a summer wedding! Weather… it is one of the things you cannot control on a wedding day. Will it be sunny, cloudy, +30 or -10?! No matter how much you speculate, you won’t know until the day finally arrives. As a wedding photographer, it is part of our job to come up with a plan B (and sometimes even a plan C or plan D!). But every once in a while, you’ll get lucky and the weather will surprise you in a way for the best! 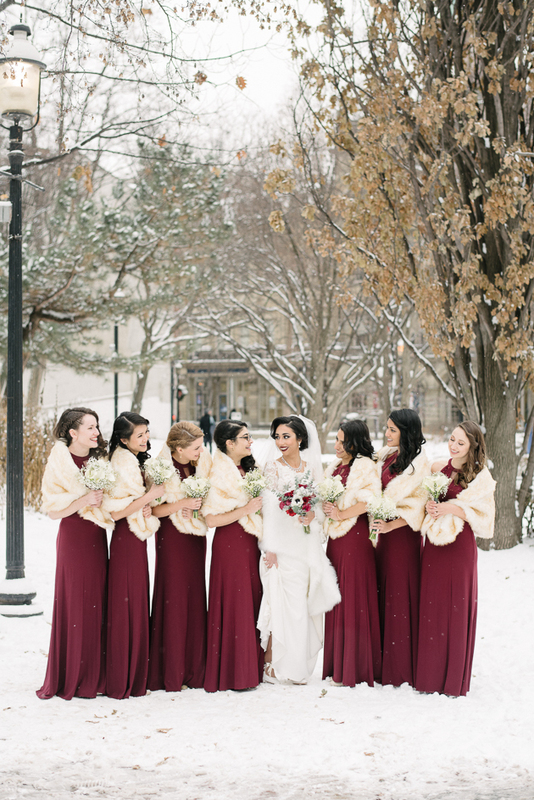 And this winter La Maquette wedding was just one of those times. 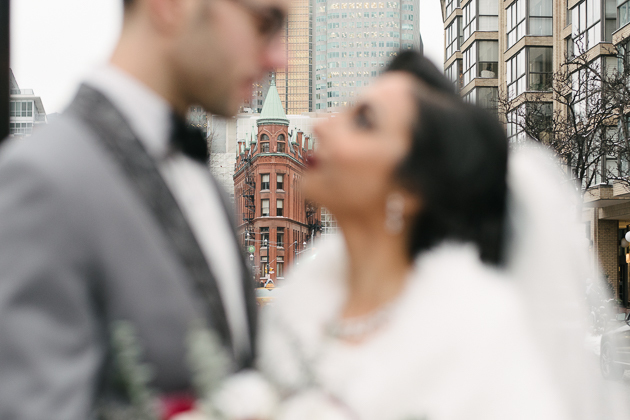 Thanks to the softly falling snow, the perfect backdrop for a magical cityscape was set in place for Negin and Muhammad’s wedding day. 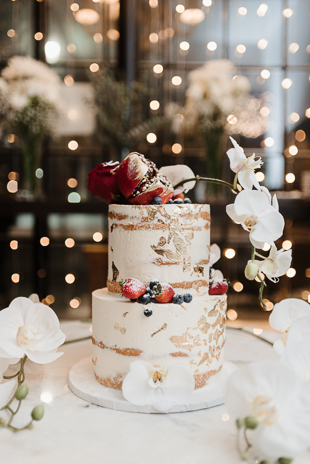 They both grew up in Toronto and as such, it was of the utmost importance for them to have their special day in the city. 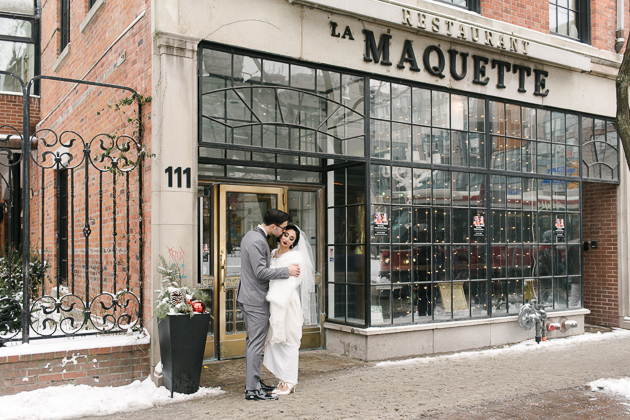 The couple decided on a La Maquette wedding for its downtown location and fabulous vintage charm. 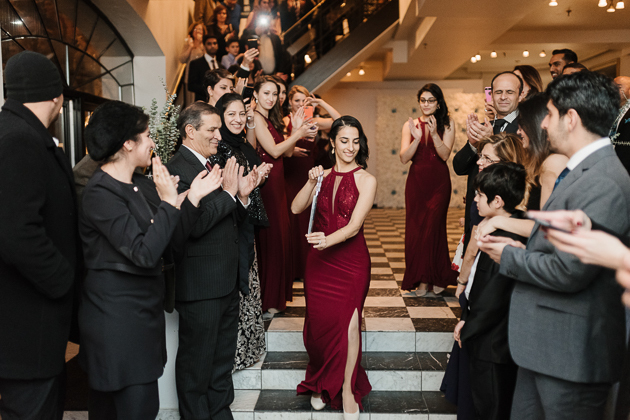 Negin’s family is Persian and Muhammad’s is Lebanese, so the couple wanted to blend two cultures and make a really unique, multicultural experience for their guests. For instance, they decided to have their wedding on December 22nd to honour Yalda, the ancient Persian celebration of Winter Solstice. 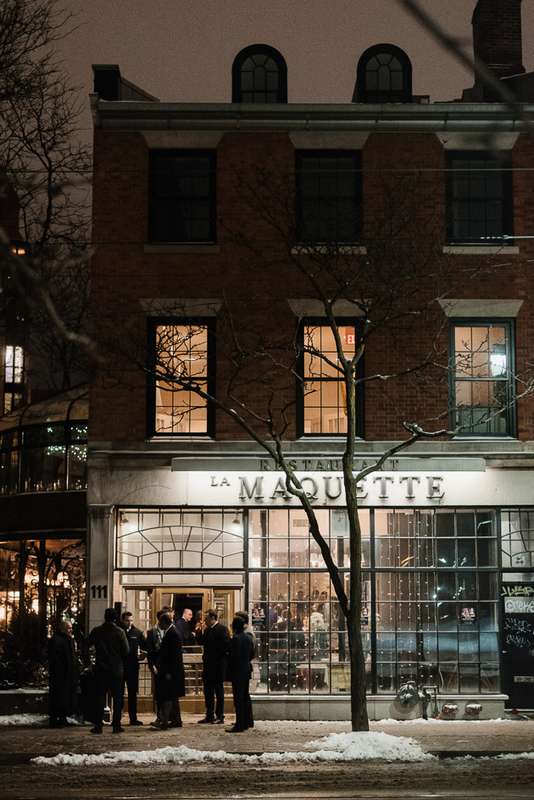 La Maquette provided a perfect venue to blend some important traditional elements with their modern style. 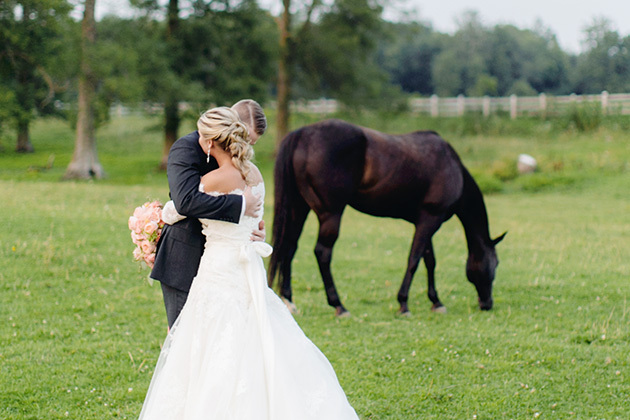 Their top priority was to create a super memorable time for them and their guests. 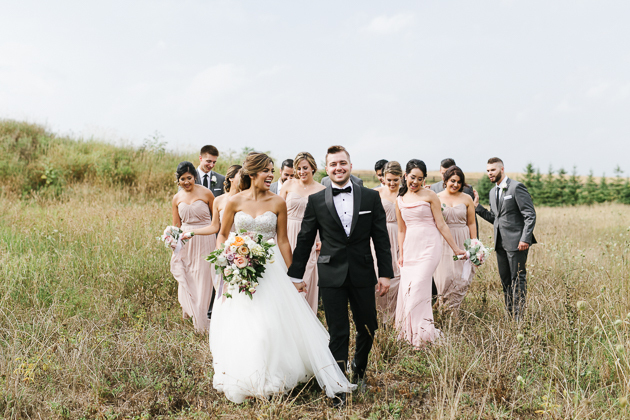 Their fabulous La Maquette wedding did not disappoint! We started the day, keeping with their vintage theme, at the classic King Edward Hotel. 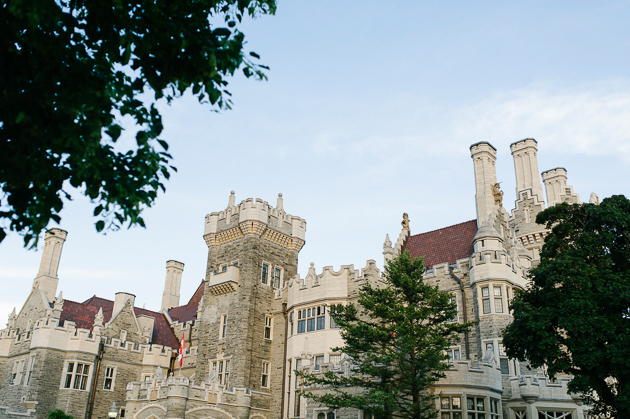 I love shooting in the King Edward, it always feels so regal and yet modern. It also allows for some really dramatic and moody photos. 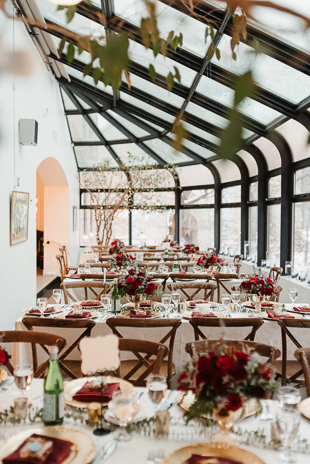 And for a winter solstice inspired wedding, it worked so well. The soft window light made for some super flattering photos that also felt very timeless and traditional. I felt a little wave of inspiration from the light snowfall and was really feeling the softness of Negin’s veil. 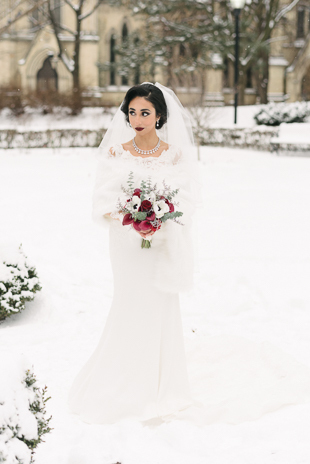 I wrapped it around her like a soft blanket of snow to create some unique bridal portraits. After meeting with Negin and Muhammad it was very clear these two wanted some epic cityscapes while also making time for fun candids. Thus, we headed from the King Edward to St. James Park. 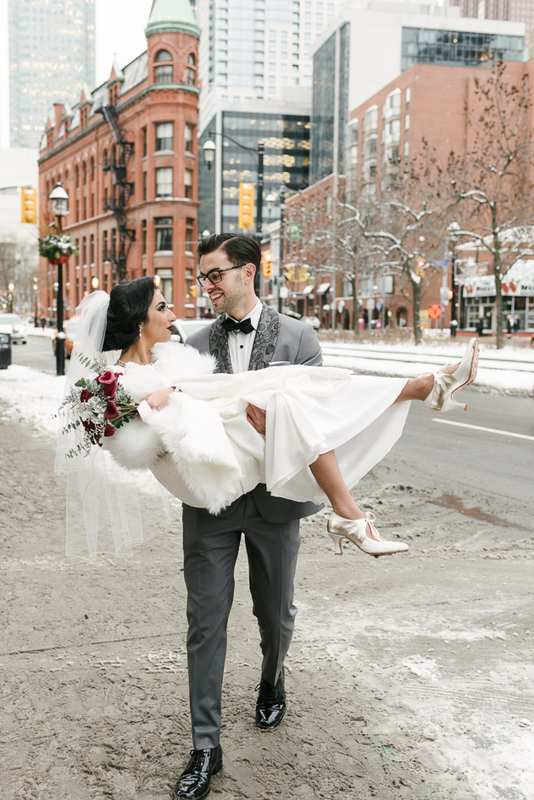 Walking around in the snowy, city streets in her heels, Negin was a total champ! It’s always such a joy when the couple is just as game as you are! Right downtown Toronto, St. James is an awesome location for wedding photos thanks to it’s spectacular cathedral and garden-like grounds. 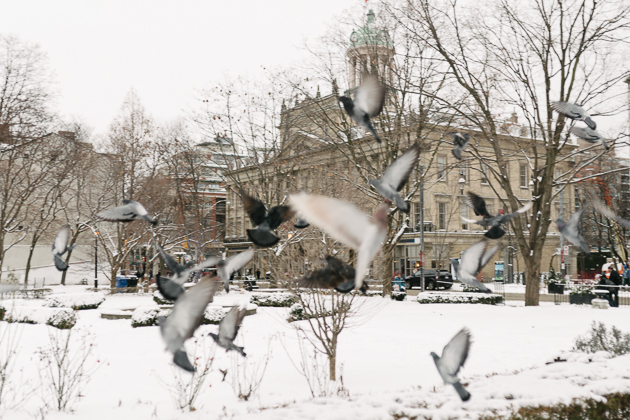 Although on this snow day, the grounds were covered with a beautiful sheet of white. And despite the weather, the whole wedding party was having an absolute blast! After the park the couple and I ran around the intersections near the flatiron building. 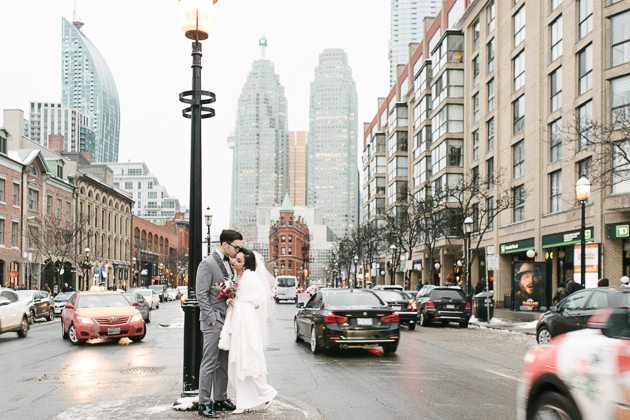 Standing in the middle of the boulevard, with traffic flowing and the snow falling, we captured some truly stunning images. No matter the weather or busy city streets, you can really feel the genuine love these two have for each other. 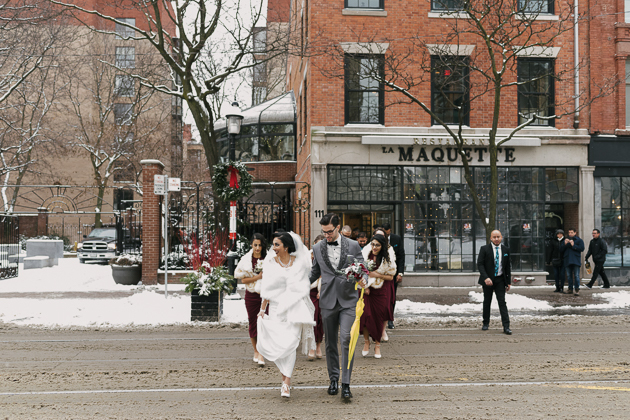 Back at La Maquette, we slowed things down a bit as the ceremony got underway. And wow, was so beautiful! The blue details of the ceremony decor were chosen to represent persian turquoise. I love capturing all the intricate and meaningful details of the sofreh. Along with their family and friends, it creates such a beautiful stage for the couple to get married in front of. Sitting at the front of the room, Negin and Muhammad looked like royalty! Everyone cheered as we made our way upstairs for dinner. 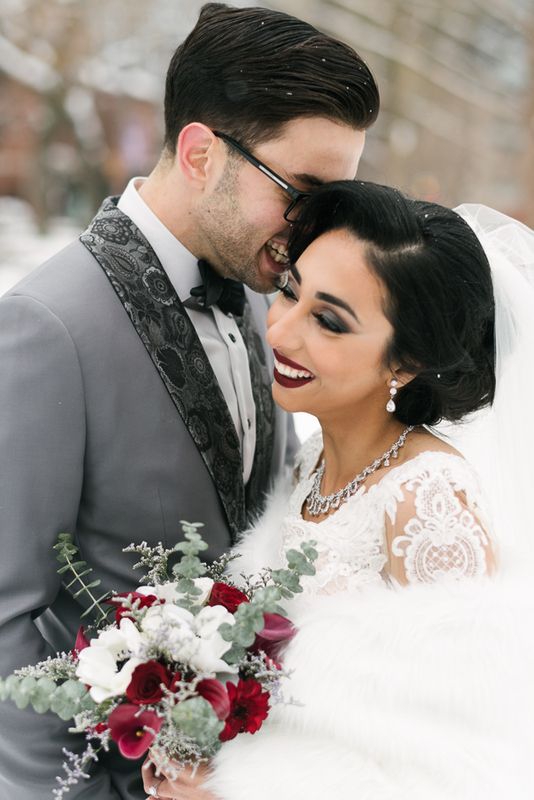 After coming in from the snowy weather, the reception details definitely warmed up the soul! 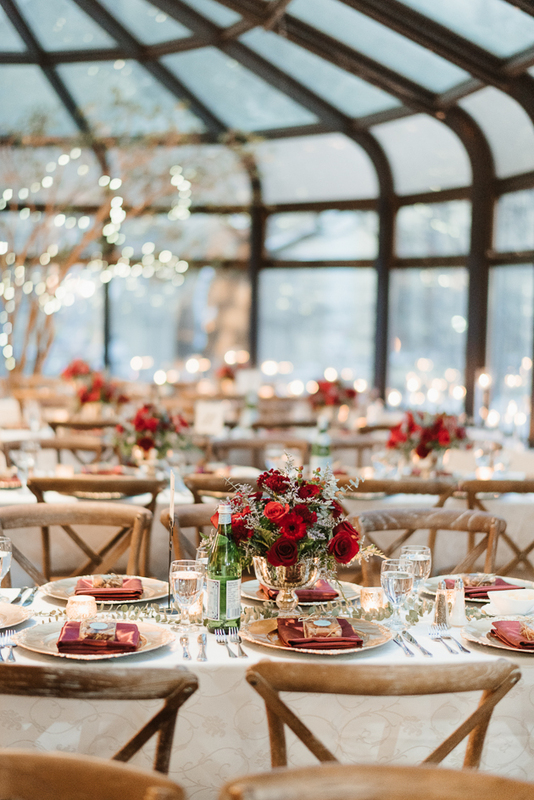 With a rich colour palette of green and deep burgundy, the romantic mood was set. Pomegranate is a major symbol of Winter Solstice and the deep reds were chosen to illustrate the Yalda theme. The vibrant colours were so fun to photograph – it created such a cool vibe when contrasted with the vintage look of the venue. 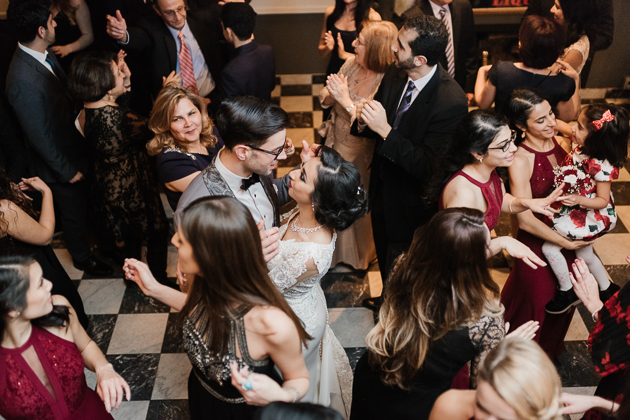 Once the dance floor opened, these two sure showed some killer moves. 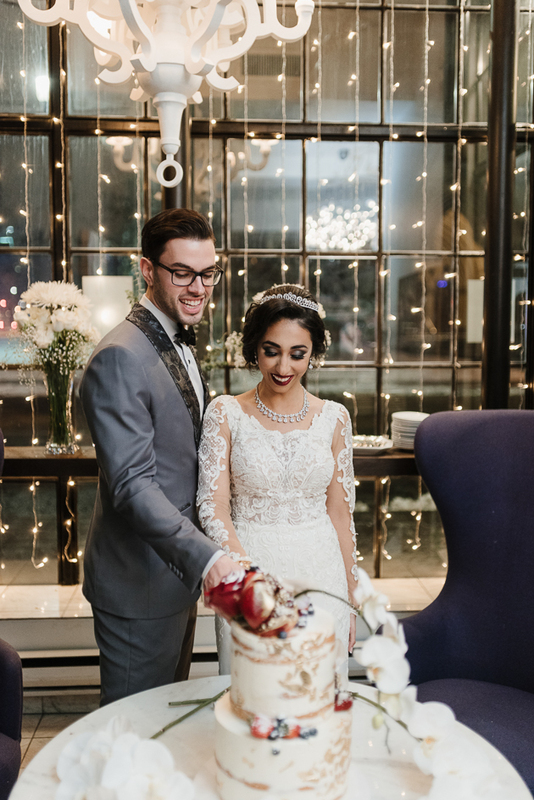 Negin and Muhammad are the cutest, they took dance lessons to make sure their first dance was extra memorable. And with La Maquette’s black and white checkered floor at their feet, it had such a wonderful vintage flair! 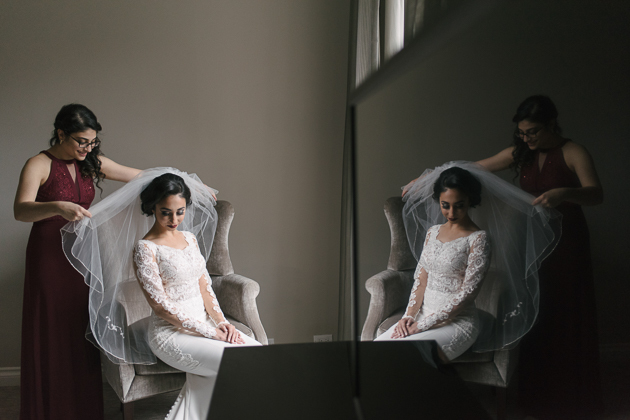 Negin and Muhammad, I will never forget your truly special wedding. No matter when or where, it most certainly was one-of-a-kind.